In order to do this we reached out to different activist and bike fun groups, to make sure there was interest in the project. Once we established that people were down with the sound, we set out building prototypes. 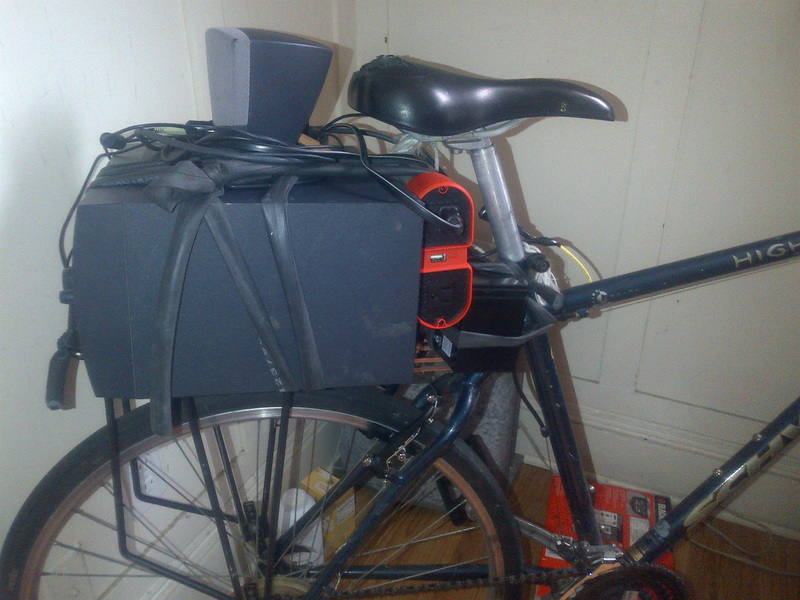 Our research and experimentation helped us to secure several prototypes of bike sound systems that could be easily replicated by others. The prototypes cover a spectrum of styles, with different costs and equipment associated with each. All systems have virtually the same components; speakers, an amp, and a power source. Because of this, there are numerous ways one could assemble sound system specific to their own wants and needs. The first step for anyone wanting to equip themselves for the sound swarm is to determine their means and needs. What kind of bike do you have? Do you have a front or back rack? Do you have a trailer? How much can you spend? Answering these questions can help determine what type of battery and amp/speaker set up to use. AA–Some amps run on ubiquitous batteries, like AA’s. These have a shorter run time than other systems and require more frequent charging and battery changes. However, they are simple and cost effective, and very light. Sealed Lead Acid–SLA batteries are not eco-friendly by any means. They are often made in China, but can also be found manufactured in the US. The positive side to them is that they are powerful and cost effective (about $20 online). They are also relatively light, while being capable of powering a sound system for hours at a time. Lithium–Lithium batteries are widely considered the most efficient batteries. They are lightweight, powerful, and their manufacture is less harmful to the environment than that of SLA batteries. However, they are significantly more expensive than SLA batteries, costing about $50. 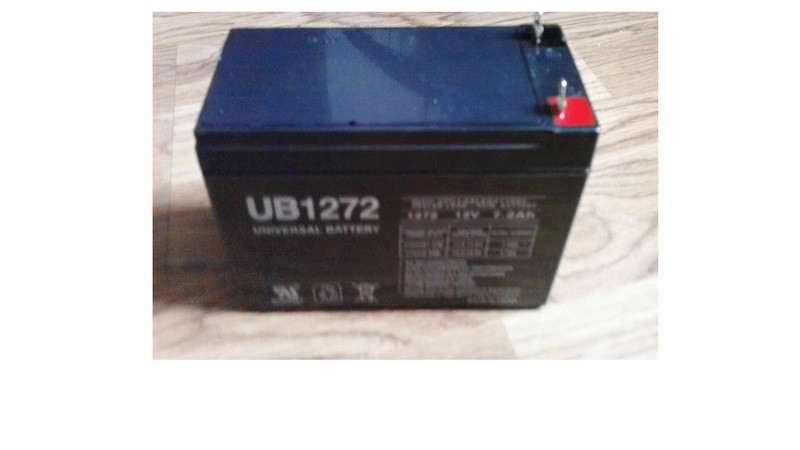 Deep Cycle–Deep cycle batteries are the longest lasting and most powerful batteries for a bike sound system. These should be used to power larger amp and speaker set ups. They are heavier than other batteries, and pretty spendy at about $90. Dayton DTA 1-Class–This is a lightweight, compact, and fairly cheap amp that runs on AA batteries. It is perfect for someone who wants an easy to set up system, but doesn’t need a ton of power. It costs about $50 online and is compatible with any speakers, which means you don’t have to spend a lot on speakers with this amp. 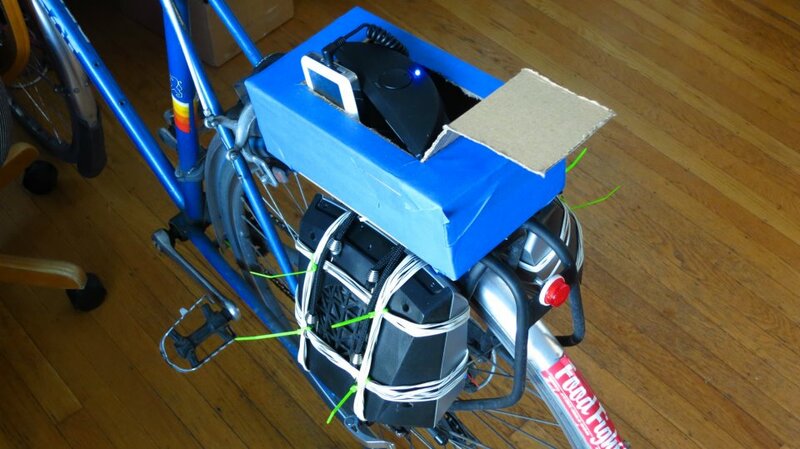 Car/Motorcycle Amp–These amps are lightweight, cost effective (about $15 online) and can connect directly into a battery, which makes them ideal for most bike sound systems. Most motorcycle amps are 2 channel, so if you want to run two speakers and a subwoofer, it would be better to look into a car amp, or computer speaker setup. Computer Speakers/Amp–Computer speakers generally have an incorporated amp, and often a subwoofer as well. These are generally fairly cheap, and can be bought second hand for about $15. The downside to this is that most computer speakers use an AC connector, and therefore require a power inverter to run on a battery. This makes them less efficient, and requires the purchase of an inverter. Other Amps–Other amps can be used for the system, as well. Many of these will require an AC/DC power inverter, in order to work with a battery. If you want a huge system, a guitar or bass amp and speaker cabinet might be the way to go. Just be sure that you use a powerful enough battery and that your amp doesn’t draw a higher wattage than the inverter allows. 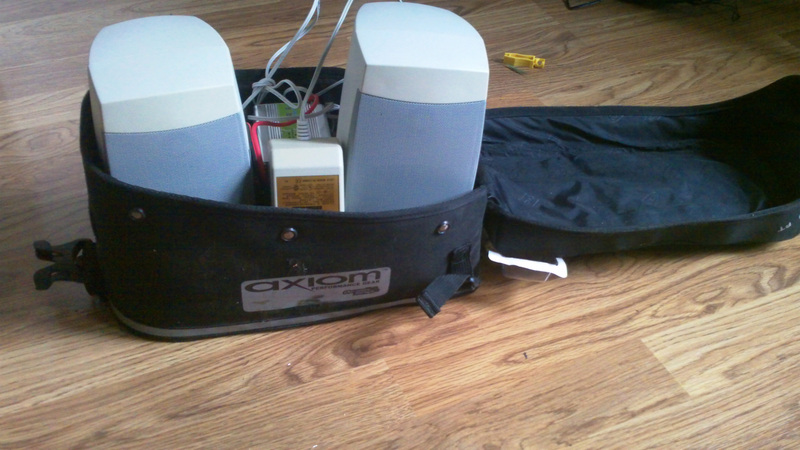 Motorcycle Speaker Kits–These are cheap, lightweight, easy to use, and generally weatherproof. For those reasons, these are ideal for most cyclists. 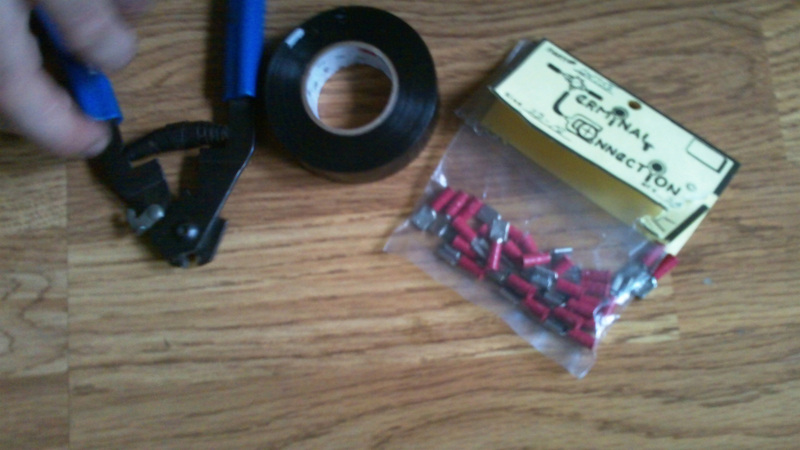 These can be easily used with motorcycle amps and most batteries. They are made to connect directly to DC power, so they do not require an inverter. They cost about $30 online. One possible downside is that they are mid range systems, without subwoofers, so bass is not prominent through these systems. Car Speakers–These can be bought in a variety of wattages and styles, and are easy to connect to all amplifiers. PA Speakers–These can be found second hand or online, or at abandoned schools or gas stations. They are treble heavy, and lightweight. These are good for people who want a mid-range sound and a light setup. Other Speakers-Speakers can be found at thrift stores or garage sales. Most speakers can easily connect to amplifiers and can be very cheap. Once you’ve decided which route you want to go, assembling the system is easy. I decided to start with a SLA battery, some computer speakers, and a power inverter. The total cost was about $70, which includes a charger for the battery. Chargers are a little pricey, but you only need one, and you can share with a friend. 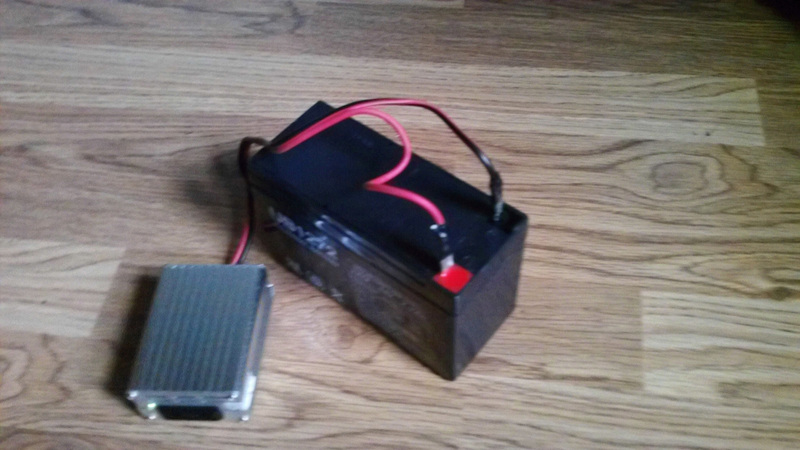 I used a 12 volt SLA battery that weighs about 4 lbs. It cost about $20 on Ebay. 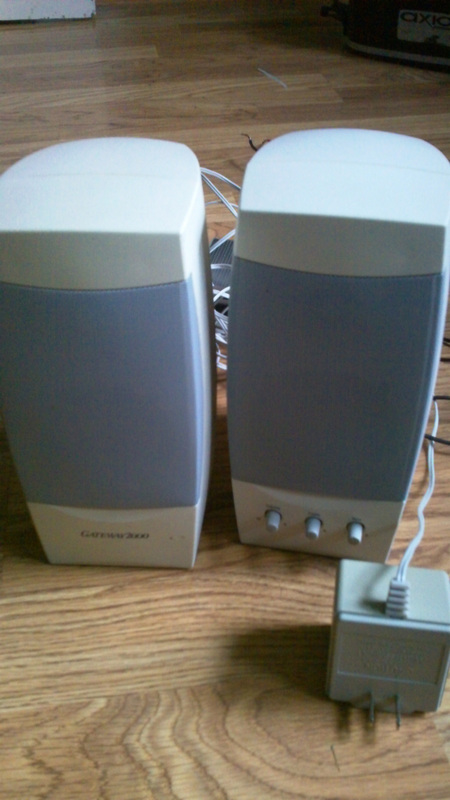 I had these old computer speakers with a built in amp. The speakers use AC power, so I had to get an inverter. It’s 100 watt and cost me about $15 on Ebay. When using an inverter, make sure it has colored wires so you can tell which way to connect it to the battery. Also, make sure that your amp doesn’t draw more wattage than the inverter is rated for. You’ll need some electrical tape, terminal connectors, and wire cutters. If you don’t have wire cutters, scissors will work just fine. 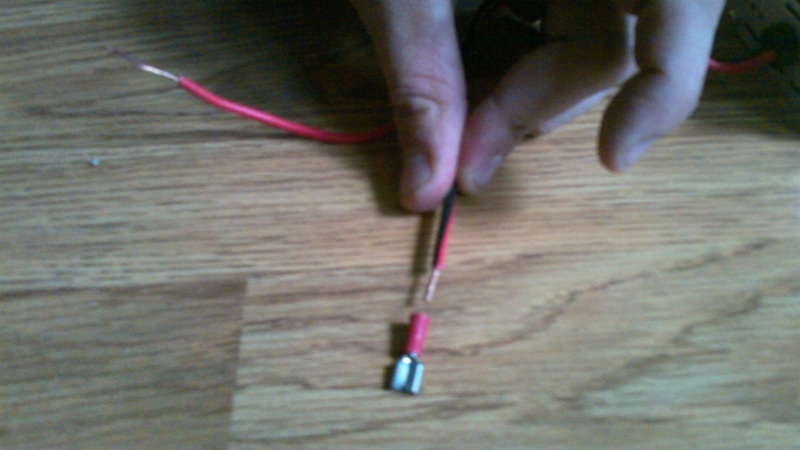 The terminal connectors can be purchased at any local hardware store for about $5. 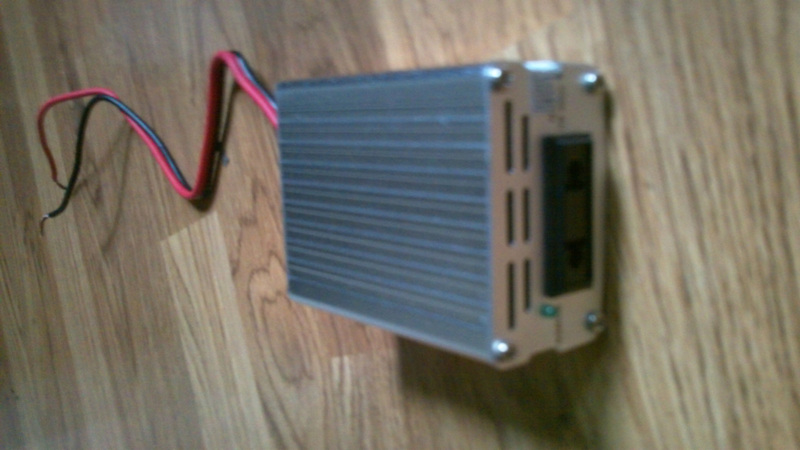 Inverters are usually made to connect to the cigarette lighter power source in a car. 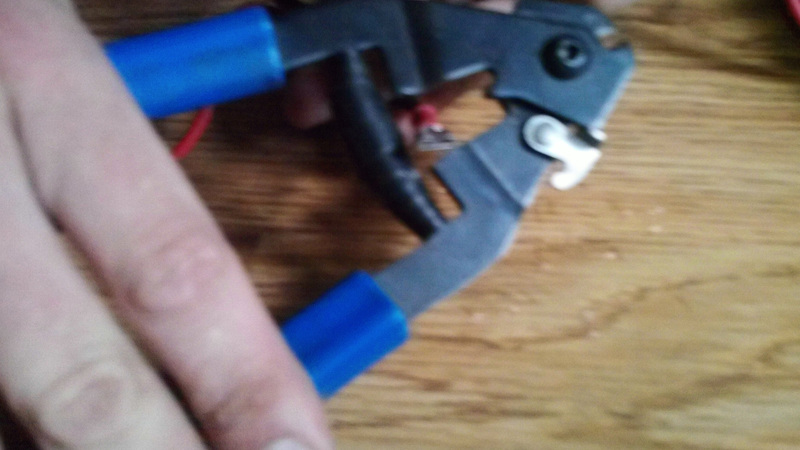 When you get your inverter, use the wire cutters to cut off the car adapter on the end. 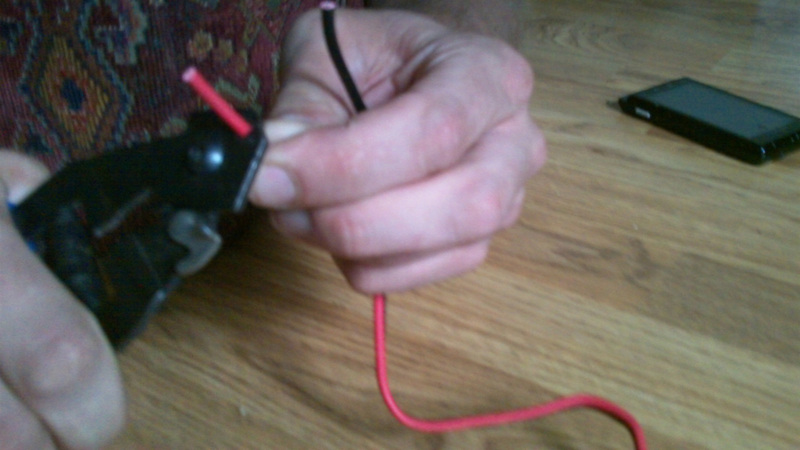 Then take both the red and black wires, and cut the rubber sheath off at a length equal to the length of the terminal connectors. Slide the terminal connector over the exposed wire and, using your wire cutters, clamp the end where the connector meets the wire. You can reinforce the connection with some electrical tape. Then you just slide the terminal connectors onto the battery. Then you just have to plug your speakers in! 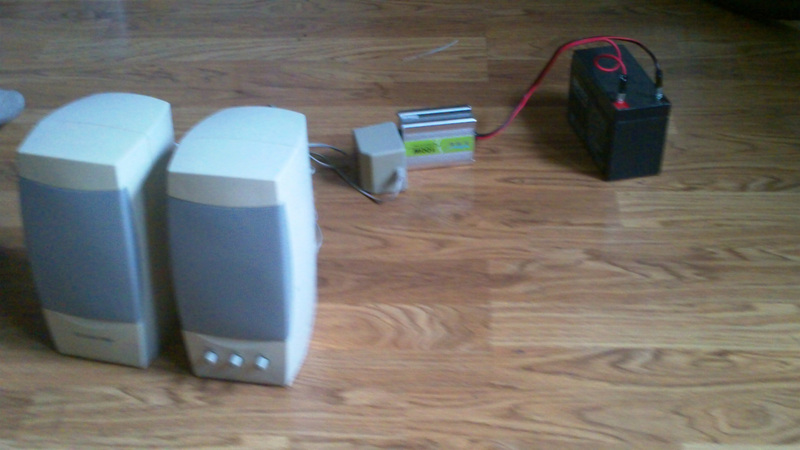 This is a very similar setup, using computer speakers with a subwoofer, an SLA battery, and an inverter. 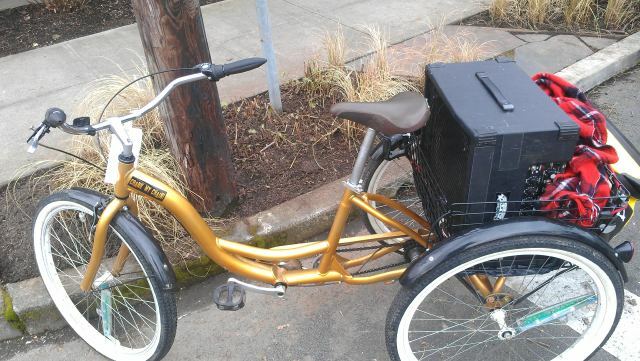 The Disco Trike uses a Deep Cycle battery with an inverter and an amp/speaker cabinet. Though systems using batteries with inverters are easy and cheap, they are far from ideal. Inverters are problematic, and tend to short out often. If you have the money, it would be well worth it to invest in a lithium battery and motorcycle amp kit. They are lightweight, weatherproof, and efficient. Once you have a core group of equipped and committed cyclists, you have the sound swarm at your service. The sound swarm can be used in a variety of ways, ranging from bike fun to direct action tactics. Sound swarm is a good way to form a bridge between bike fun groups and political bike groups. Roaming, decentralized dance parties are possible with a sound swarm. Music also has galvanizing effects on protesters. Sound swarm tactics can take modern revolution to a whole new level. What’s a revolution without music, anyway?